After a 4-yard run on the opening play of the game, the hosts’ initial possession featured a holding penalty, a sack for a loss of 9 yards, an injured left knee for left guard Shawn Lauvao — who was taken to the locker room in a wheelchair — and a three-and-out punt. 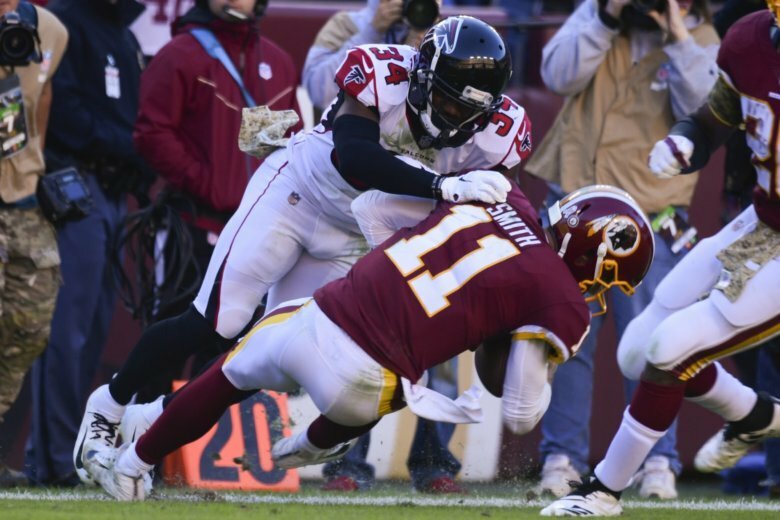 Washington’s following drive also ended in a punt, but not before Alex Smith threw a ball that hit a Falcons defender’s helmet, receiver Josh Doctson dropped a pair of passes, and right tackle Morgan Moses limped off with an injured right knee, although he later returned. “Caught us with our pants down and hit us in the mouth,” Washington cornerback Josh Norman said. Atlanta (4-4) began the third quarter with an eight-play drive that finished with Ryan’s third of four TD passes for the afternoon — a 10-yarder to running back Tevin Coleman — that boosted its advantage to 28-7. The Redskins have thrived on offense with 33-year-old running back Adrian Peterson carrying the load. But he only ran nine times for a measly 17 yards through the opening two quarters, when Washington’s best gain was 22 on a scramble by quarterback Alex Smith. Nearly sacked, Smith spun out of a defender’s arms and turned it into a run up the sideline ending with a pop from Atlanta’s Brian Poole that was so big it drew an “Ohhhhh!” from spectators. It helped extend an 11-play, 80-yard drive that finished with Smith’s 2-yard fade pass to Doctson for a TD that cut Washington’s deficit to 14-7 late in the opening half.